Tesco is continuing to push blinkbox, its digital movie and book service, via the carrot that is bonus Clubcard points. First we had the chance to earn 100 Clubcard points for buying a £1 ebook (still running, but at the poorer rate of 100 points per £2 book) and then 1,000 points and a free pizza when you rented ‘Game of Thrones Season 4’ (now over). There was also 500 Clubcard points for buying ‘The LEGO Movie’ (now over). 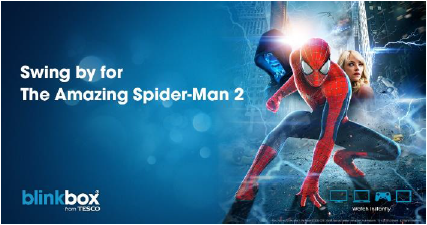 Until September 13th, you will earn 500 Clubcard points (1,200 Avios or 1,250 Virgin Flying Club miles) when you buy ‘Spiderman 2’ from blinkbox. Note that you need to buy the film and not rent it. Full details can be found here on the blinkbox website. If you have a passing interest in seeing the film, it is not a bad deal. The movie only costs £9.99. As you will receive 1,200 Avios back, you are only paying 0.8p per Avios point. I can live with that. I imagine you can use a ‘grabber’. You can download the films, but you have to at least have an internet connection to verify the digital rights. You can’t burn them onto DVD etc. It gives a full explanation in the FAQ. I just happened to read it over the weekend. I still haven’t received my points for the Lego movie, has anyone else? Bought it the day it was posted on here. What about for Game of Thrones? I got mine for Game of Thrones within a few weeks. They posted within a few days for me. They sent me an email saying that they messed up…. Gave me £5 credit and promised the points next statement also. Same here… Happy to use the credits on this promo though as they will otherwise expire end of this month. Not bad! £4.99 for £5 points! The Game of Thrones points depends on when you bought it. If you bought it between 17/06/2014 – 30/06/2014 then you get the points August and if between 01/07/2014 – 31/07/2014 then you get them in November. On the Lego Movie – i emailed their customer service team who advised that points should be added in October. I recommend waiting as the price might drop a pound or so, while promotion still running (hard to change those promotion T&C agreed with several parties). It happened with Game of Thrones. Really not a fan of 999 pricing either which means loosing a Tesco point. That’s the proper HFP spirit – shame to lose that extra point! I’m not brave enough to challenge my wife about buying groceries or petrol at Tesco and letting the bill end at £X.99. An extra penny would earn us an extra Clubcard point plus 2-3 extra MR points (paying with Amex PRG). Little bit of ginger 4p? Unless you’re really into it, Amazing Spiderman 2 isn’t worth the outlay for the points. If they were doing an offer for extra points on the DVD/BD, I’d say go for that and flog the disk. Although, if you have kids, they might ignore the fact that the film is poor! Can’t believe people are still doing this! 0.8p per Avios is, frankly, shocking value. You people have been blinded by this buffoon for far too long.